Persistence Market Research (PMR) provides an exclusive analysis of the global specialty cosmetic ingredients market in its report titled “Specialty Cosmetic Ingredients Market: Global Industry Analysis 2013-2017 and Forecast 2018–2026”. The main aim of this report is to offer exhaustive analysis and insights pertaining to the specialty cosmetic ingredients market. This report offers a comprehensive analysis of the specialty cosmetic ingredients market in terms of market volume (Tons) & value (US$ Mn) and year-wise (Y-o-Y) growth on the basis of segmentation by type and application. The specialty cosmetic ingredients market study considers 2017 as the base year with market values estimated for 2018 and a forecast developed for the duration of 2018 to 2026. The Compound Average Growth Rate (CAGR) has been represented from 2018 to 2026. The specialty cosmetic ingredients market study covers value chain analysis, market dynamics and industry growth analysis, along with segmental-level projections in a comprehensive manner. As per the industry experts and findings of the report, the global specialty cosmetic ingredients market is projected to grow at a CAGR of 4.4% between 2018 and 2026, in terms of value. Increasing demand for cosmetics and personal care products is one of the key factors assisting the growth of the specialty cosmetic ingredients market. The Persistence Market Research report on specialty cosmetic ingredients analyses the market at a regional as well as global level through market segmentation on the basis of type and application. The primary objective of the specialty cosmetic ingredients market report is to offer key insights on current trends, competition positioning, growth rates, market potential and other relevant information and statistics in a suitable manner to readers and various stakeholders in the specialty cosmetic ingredients market. Specialty cosmetic ingredients are the ingredients that are added to end products to impart specific benefits, such as water resistance and foaming, among others. The specialty cosmetic ingredients market is vast with a wide portfolio of products and is still expanding with the introduction of new and innovative specialty cosmetic ingredients that are being launched by the key market players. The global specialty cosmetic ingredients market has witnessed recent consolidations with manufacturing capacity expansions and expansion into high growth regions. These strategic steps of developments are being taken by strong specialty cosmetic ingredients market participants such as BASF SE, Evonik Industries AG, Akzo Nobel N.V., Solvay SA, The Dow Chemical Company, Lonza Group, Eastman Chemical Company, Clariant AG and Innospec Inc., among others. The report is structured to facilitate readers to develop a thorough understanding of the specialty cosmetic ingredients market. It begins with market taxonomy, followed by market definitions, market background and market dynamics and analysis of the market by key segments, regional market analysis and competition assessment. Each section of the specialty cosmetic ingredients market report covers a quantitative as well as qualitative assessment of the market on the basis of historical developments, facts, key opinions collected from the market participants through interviews and trends followed by the market. In the next section, the report describes the specialty cosmetic ingredients market structure, macro-economic factors, forecast factors, regional weighted average pricing analysis and an overview of value chain along with profitability margins and an indicative list of the key stakeholders involved in every stage. The next section of the report provides value (US$ Mn) and volume (Tons) projections for the specialty cosmetic ingredients market on the basis of respective segments at a global level. The global specialty cosmetic ingredients market values represented in this section have been agglomerated by collecting data and information at a regional level. Specialty cosmetic ingredients market information along with the key insights and facts covers unique analysis frameworks, such as year-on-year growth trend comparison, absolute $ opportunity analysis, market attractiveness and share analysis for each sub-types of the segments covered in each segment. 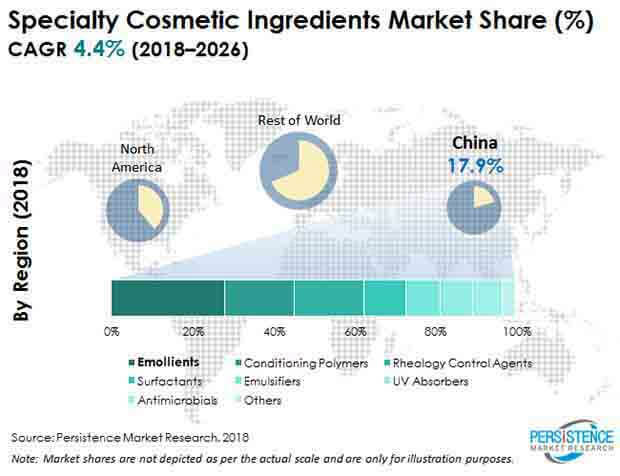 The subsequent section of the specialty cosmetic ingredients report presents a summarized view of the global specialty cosmetic ingredients market, based on seven prominent regions considered in the study. The market analysis section of the specialty cosmetic ingredients report covers weighted average pricing analysis and market projections for each segment, including market share analysis, Y-o-Y growth trends, market attractiveness analysis, market share analysis and incremental $ opportunity assessment. All the above sections evaluate the present market scenario and growth prospects in the global specialty cosmetic ingredients market while the forecast presented in the section assesses the market size in terms of volume and value. The market numbers, pertaining to the regional as well as country level data and various segments, have been estimated through a combination of primary and secondary research. Key sources referred to arrive at the global specialty cosmetic ingredients market size include specialty cosmetic ingredients manufacturers, suppliers, end-users, industry association & trade experts, along with the secondary documents available through public domain, paid database and PMR’s in-house data repository. In order to offer an accurate market forecast, PMR’s proprietary regression analysis forecast model was then utilized to drive the specialty cosmetic ingredients market estimation for forecast years, which takes into account effects of certain direct and macro-economic factors on the global and regional target market. The pertinent opinions of key primary respondents for specific segments and geographies were also taken into consideration while forecasting the segment level market size and dynamics for the specialty cosmetic ingredients study. In the final section of the report, a competition landscape of the specialty cosmetic ingredients market has been included to provide report audiences with a dashboard view categorized on the basis of providers present in the value chain, their specialty cosmetic ingredients market presence and key differentiating strategies. Detailed profiles of competitors have also been included under the scope of the report to evaluate their long-term and short-term strategies, key offerings and recent developments in the specialty cosmetic ingredients market. Specialty cosmetic ingredients are the specialty ingredients that are added to body products and cosmetics to impart specific properties to the end product. The global specialty cosmetic ingredients market report provides an overview of the market dynamics including drivers, restraints, opportunities, trends, value (US$ Mn) and volume (Tons) projections, along with detailed information regarding recent developments for the period between 2017 and 2026. The global specialty cosmetic ingredients market has been segmented on the basis of product type into emollients, surfactants, conditioning polymers, rheology control agents, UV absorbers, emulsifiers and antimicrobials. These specialty cosmetic ingredients add various unique properties such as foaming and water resistance to the end cosmetic product. Hence, specialty cosmetic ingredients find a diverse set of applications such as hair care, skincare, oral care, fragrance and make-up cosmetics. The global market was pegged at US$ 9595.3 Mn in 2017 & is expected to expand at a CAGR of 4.4% during the forecast period. Increasing consumption of cosmetics and personal care products with rising advancements and innovations in end products are some of the factors driving the growth of the specialty cosmetic ingredients market. Conditioning polymers are extensively used as specialty cosmetic ingredients in cosmetic products such as shampoo, body wash, liquid hand wash, and a variety of hair and skincare products. Most importantly, conditioning polymers are used in sweat-proof cosmetics, which register high demand in warm and temperate regions of the globe. Attributing to this, the conditioning polymers segment of the global specialty cosmetic ingredients market is reported to hold a significant share of 22.3% in 2018. By type, the emollients segment has been gaining traction with the large-scale adoption of emollients in a wide range of skincare products, owing to their lubrication and moisturizing properties. This segment is anticipated to witness a growth rate of 4.9% during the forecast period, aided by the rapid growth in the demand for moisturizers worldwide. Surfactants are lipids that are widely used as specialty cosmetic ingredients. The key factor that drives their application as specialty cosmetic ingredients is that they are compatible with both oil and water. Hence, they are used in cosmetics for foaming, cleansing, thickening and other special effects. As a result, they form a major class of specialty cosmetic ingredients. They can be further sub segmented into anionic, non-anionic, cationic, and amphoteric, among others based on the charge carried by the surfactant molecule. Of these sub-segments, the anionic sub-segment is pegged to remain prominent, valued at US$ 659.3 Mn in 2018. It is expected to account for a substantial share of 36.9% by the end of 2026. This upsurge in the segment’s share can be attributed to the growing demand for cleansing products, in which anionic surfactants are one of the key specialty cosmetic ingredients. Skincare and hair care are the prominent application segments in the global specialty cosmetic ingredients market. Recent trends of urbanization and development in industries such as film and fashion have resulted in an upsurge in specialty cosmetic ingredients sales in the makeup application segment. This market trend is specific to certain regions such as North America, where the makeup segment is expected to register 1.1% growth by the end of 2026. North America and Europe are pegged to be prominent regions in the global specialty cosmetic ingredients market with the presence of noteworthy market players. Rapidly growing economies of countries such as India and China in the SEAP (South East Asia and Pacific) region offer ample opportunities of growth in the global specialty cosmetic ingredients market. China has been emerging as a significant region in the global market since the country is open to public, private and foreign investments. Manufacturers of specialty cosmetic ingredients are expanding and specifically investing in this region as it offers high growth opportunities in the global specialty cosmetic ingredients market. The global specialty cosmetic ingredients market is fairly consolidated, with prominent manufacturers holding substantial market shares as of 2017. Some of the prominent players covered in this market study include BASF SE, Croda International Plc., Evonik Industries AG, Akzo Nobel N.V., Solvay SA The Dow Chemical Company, Lonza Group, Eastman Chemical Company, Clariant AG, Ashland Global Specialty Chemicals Inc., and Innospec Inc., among others. In the recent past, the global specialty cosmetic ingredients market has witnessed compelling advancements in the specialty cosmetic ingredients product portfolios of key players; some of which are mentioned below. How has the specialty cosmetic ingredients market evolved in the past four years? What shape is the specialty cosmetic ingredients market expected to take in terms of volume and value during the study period? What are some of the prevailing market dynamics in the specialty cosmetic ingredients market? What are the competition developments and trends in the specialty cosmetic ingredients market? What are some of the underlying macro-economic and industry factors impacting the growth of the specialty cosmetic ingredients market? What are the important key challenges, opportunities and improvement factors for specialty cosmetic ingredients market players? What are the important market positioning and key strategies of key manufacturers as per the specialty cosmetic ingredients market taxonomy? How is the competition structured at present and how has it evolved in the specialty cosmetic ingredients market over the past few years?